Writing texts for hymns of our day is not easy. The language base has changed, and the rate of change is faster today than ever before. The global scope of subject matter is also wider than it has ever been. It is a challenge to writers to write hymns now that do not fall over the wall of propriety, but faithfully evoke sharp images and feelings as they examine the truth. John Thornburg’s hymns meet this challenge. They are pungent and fresh, full of metaphor and imagery. 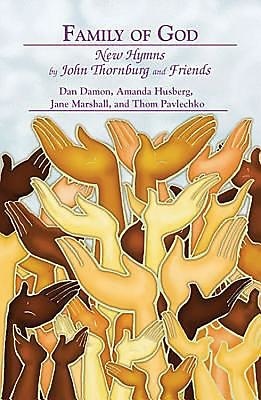 His composer-partners Dan Damon, Amanda Husberg, Jane Marshall, and Thom Pavlechko, have written hymn tunes that underscore John’s verbal techniques accurately, while keeping the music singable for congregations. Each hymn is presented first as poetry, where Thornburg’s ability is most prominently displayed. Then it is included as interlined within music, in standard hymn format. Finally, each is printed in tune-line format, suitable for bulletin inserts. Family of God is the most recent addition to the Abingdon Press Hymn Series.